The functor front-end is the preferred front-end at the moment. It is more powerful than the standard front-end and has a more readable transition table. It also makes it easier to reuse parts of state machines. Like eUML, it also comes with a good deal of predefined actions. Actually, eUML generates a functor front-end through Boost.Typeof and Boost.Proto so both offer the same functionality. They are more typing and information than we would wish. This means syntactic noise and more to learn. Function pointers are weird in C++. It is not easy to reuse action code from a state machine to another. The advantage of functors compared to functions are that functors are generic and reusable. They also allow passing more parameters than just events. The guard functors are the same but have an operator() returning a bool. It is also possible to mix rows from different front-ends. To show this, a g_row has been left in the transition table. Note: in case the action functor is used in the transition table of a state machine contained inside a top-level state machine, the “fsm” parameter refers to the lowest-level state machine (referencing this action), not the top-level one. To illustrate the reusable point, MSM comes with a whole set of predefined functors. Please refer to eUML for the full list. For example, we are now going to replace the first action by an action sequence and the guard by a more complex functor. and now will execute some_action and start_playback every time the transition is taken. ActionSequence_ is a functor calling each action of the mpl::vector in sequence. It even starts looking like functional programming. MSM ships with functors for operators, state machine usage, STL algorithms or container methods. You probably noticed that we just showed a different transition table and that we even mixed rows from different front-ends. This means that you can do this and leave the definitions for states unchanged. Most examples are doing this as it is the simplest solution. You still enjoy the simplicity of the first front-end with the extended power of the new transition types. This tutorial, adapted from the earlier example does just this. This also means that you can, like in the transition table, write entry / exit actions made of more complicated action combinations. The previous example can therefore be rewritten. Usually, however, one will probably use the standard state definition as it provides the same capabilities as this front-end state definition, unless one needs some of the shipped predefined functors or is a fan of functional programming. What do you actually do inside actions / guards (Part 2)? Like states, state machines can be defined using the previous front-end, as the previous example showed, or with the functor front-end, which allows you to define a state machine entry and exit functions as functors, as in this example. providing a Row in the state machine's transition table with none as target state defines an internal transition. providing an internal_transition_table made of Internal rows inside a state or submachine defines UML-conform internal transitions with higher priority. transitions defined inside internal_transition_table require no source or target state as the source state is known (Internal really are Row without a source or target state) . Like for the standard front-end internal transitions, internal transition tables are added into the main state machine's table, thus allowing you to distribute the transition table definition and reuse states. There is an added bonus offered for submachines, which can have both the standard transition_table and an internal_transition_table (which has higher priority). This makes it easier if you decide to make a full submachine from a state later. It is also slightly faster than the standard alternative, adding orthogonal regions, because event dispatching will, if accepted by the internal table, not continue to the subregions. This gives you a O(1) dispatch instead of O(number of regions). While the example is with eUML, the same is also possible with this front-end. 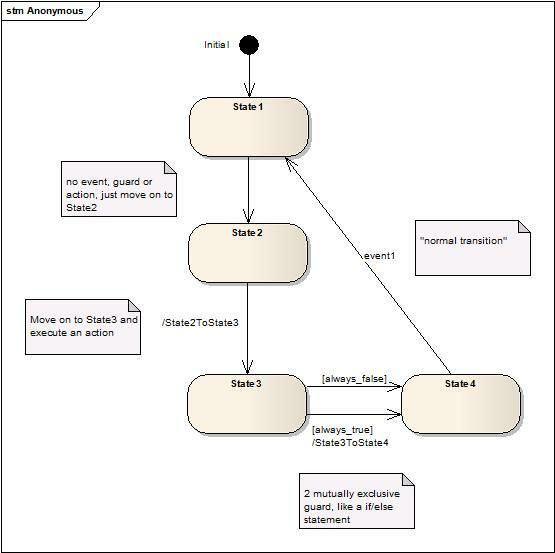 Pseudo entry states do not necessarily want to know the event which caused their activation, or they might want to know only a property of it. MSM supports a boost::any as an acceptable event. This event will match any event, meaning that if a transition with boost::any as event originates from the current state, this transition would fire (provided no guards or transition with a higher priority fires first). This event is named Kleene, as reference top the Kleene star used in a regex. At this point, you can use this any event in transition actions to get back to the original event by calling for example boost::any::type(). The only requirement is that this event must have a copy constructor from the event originally processed on the state machine.